Since 1980, the mission of the developers of The Estates at Acqualina has been to create The World’s Finest Residences and The World’s Finest Resort. Set along over one thousand feet of pristine Atlantic Ocean beachfront, the spectacular Acqualina community is and always has been committed to the classic principles of Art, Architecture and Lifestyle. Recently, Acqualina Resort & Spa was recognized by TripAdvisor as the Top Luxury Beachfront Hotel in the Continental U.S., and is listed as both a Forbes Five-Star and AAA Five-Diamond Hotel. With its lawns, its own parks, with its signature red umbrellas, couches and amenities on the beach, Acqualina is a world of luxury unto itself. Florida. New York. Chicago. California. Over the past three decades, the Trump Group has built an impressive portfolio of hospitality, residential and commercial properties across the United States. 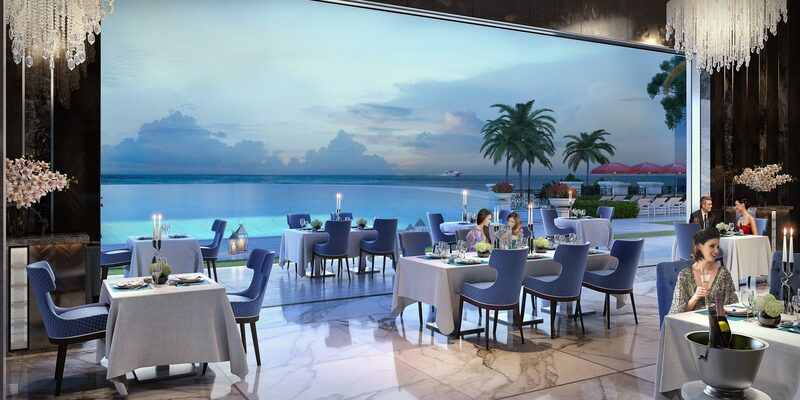 By combining unique amenities, stellar customer service and iconic buildings, the company has succeeded in providing exceptional — and award-winning — lifestyle experiences not just for today, but for generations to come. Anticipating the needs and desires of residents and guests — who are used to the best the world has to offer — is the hallmark of the Acqualina brand of service. Attention to detail, with no stone left unturned, has created a standard of professionalism instilled in each of our service providers. Here, you feel at home because everyone knows your name and everyone’s smile is genuine. At the heart of customer loyalty lies a very simple premise: customer satisfaction. A happy customer becomes a repeat customer, often over decades and generations, when the promise of the brand is fulfilled without compromise. 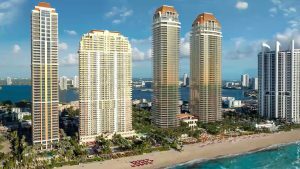 Which is why you would not be surprised to learn that 70% of the owners at The Mansions at Acqualina were, in one way or another, associated with Acqualina Resort & Spa. In a sub-tropical climate like South Florida’s, the indoor-outdoor connection has become a modern priority. Which is why you will find the larger, more grand spaces at The Estates aligned with the waterfront, allowing living rooms, dining rooms, master bedrooms and even master baths to have expansive views of the ocean. The overall concept of the community is to have modern, slender towers live in harmony not only with the outdoors but with the Palladian-inspired amenity Villa between the towers that’s connected to them by colonnades, loggias and classically configured gardens. At the Estates, our indoor and outdoor spaces are filled with both art and an artistic sensibility. You will find traditional and non-traditional paintings on our walls, sculpture in our gardens, contemporary Swarovski chandeliers hanging from our ceilings, photography adorning our public spaces and, perhaps most spectacularly of all, lobbies created by the master design icon of our time — Karl Lagerfeld. This is a world of art where beauty and imagination interact with all your senses in a true departure from the city around you. You know when you’ve arrived at The Estates at Acqualina because it is unlike any other place in South Florida. If it is beyond your expectations (as it surely will be), that is purely by design as the development and design teams have incorporated the best ideas from the world’s greatest resorts into someplace completely original. It is a place where families feel at home, life is good, and the possibilities are endless. Those who’ve created The Estates at Acqualina have traveled the world, often in search of just the right block of quartzite or marble for properly sequencing our wall patterns…or to source the nearly 2 million square feet of stone that has gone into this project. Only the best of the best has been good enough to provide the level of quality our buyers have come to expect. Time, however, is one luxury many buyers do not have and certainly don’t wish to waste. Which is why all our residences are delivered “furniture-ready.” This means that our floors are finished, interior walls are painted, appliances are upgraded and installed along with Creston, sound and A/C systems which you can control from your iPhone or smart device. Some residences even come complete with a private spa and sauna on a wrap around balcony. And, of course, the house car is a Rolls Royce.